42.48 How to create resource filters ? > How to create resource filters ? Right click on a project > Properties > Verilog Language > Resource Filters. From this wizard you can select what resources to exclude from the selected project. By default it only shows 50 children for each directory. If a directory contains more than 50 children you are not allowed to filter its content. You can modify this limit, globally, from Maximum number of children for each directory or by right-clicking on a directory and selecting Show more files. There is also a Timeout option if the project's resources are located on remote computers and the network lag may slow down the platform. The wizard will display only those children (files/folders) that were scanned before the timeout is reached. 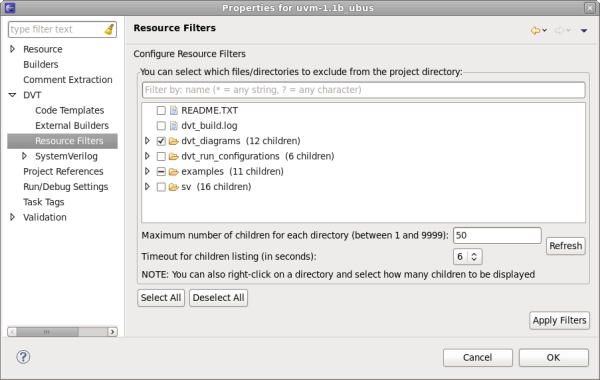 WARNING: DVT Resource Filters are not fully compatible with Eclipse's filters. If you already use standard platform's filters, it is recommended to disable them before applying DVT filters. NOTE: Linked-Resources (project's resources linked to file system directories) cannot be filtered; you can only filter their children.